Yours truly is interviewed now on the wonderful Type Theory Podcast. Very exciting! In our Computational Logic seminar here at The University of Iowa, we are studying logic programming this semester. We are using the very nice book “Logic, Programming, and Prolog”, freely available online. We were talking today about the existence of a least Herbrand model for a definite program. A definite program is just a set of clauses of the form , where each is an atomic formula (predicate applied to terms). (Free variables in clauses are interpreted universally.) If , then we just have an atomic fact in the definite program. A Herbrand interpretation is a first-order structure where each function symbol of arity is interpreted as , and each predicate is interpreted as a subset of the set of ground (i.e., variable-free) atomic formulas. A Herbrand model of a definite program P is then just a Herbrand interpretation which satisfies every clause in P. It will be convenient below to identify a Herbrand interpretation with a subset of the set of all ground atomic formulas. Such a subset determines the meanings of the predicate symbols by showing for which tuples of ground terms they hold. We will pass tacitly between the view of a Herbrand interpretation as a first-order structure and the view of it as a set of ground atomic formulas. The Herbrand base is the Herbrand interpretation corresponding to the set of all ground atomic formulas. It says that everything is true. What I want to talk about briefly in this post is the fact that the set of Herbrand models of definite program P forms a complete partial order, where the ordering is the subset relation, the greatest element is the Herbrand base, and the greatest lower bound of a non-empty subset S of Herbrand models of P is the intersection of all the models in S. In a complete partial order, every subset S of elements should have a greatest lower bound (though it need not lie in S). Alternatively — and what I am interested in for this post — we can stipulate that every subset S should have a least upper bound. The two formulations are equivalent, and the proof is written out below. “Logic, Programming, and Prolog” contains a simple elegant proof of the fact that the intersection of a non-empty set of Herbrand models is itself a Herbrand model. What I want to record here is the proof that in general, if in a partial order every subset (including the empty set) has a greatest lower bound, then every such also has a least upper bound. The proof I have seen for this is a one-liner in Crole’s “Categories for Types”. It took me some puzzling to understand, so I am writing it here as much for my own memory as for the possible interest of others, including others from the seminar who watched me fumble with the proof today! Let be a subset of . Let be the set of elements which are upper bounds of (that is, the set of elements which are greater than or equal to every element of ). The claim is that the greatest lower bound of is the least upper bound of . By the assumption that every subset of has a greatest lower bound, we know that there really is some element which is the greatest lower bound of . As such, is greater than or equal to every other lower bound of . Now here is a funny thing. Every element of is a lower bound of . Because if , this means that is greater than or equal to every element in . In particular, it is greater than or equal to . Since this is true for every , we see that is a lower bound of . But is the greatest of all such lower bounds by construction, so it is greater than or equal to the lower bound . And since this is true for all , we see that is an upper bound of all those elements, and hence an upper bound of . We just have to prove now that it is the least of all the upper bounds of . Suppose is another upper bound of . This means . Since by construction is a lower bound of , this means that , as required to show that is the least of all the upper bounds of . The final interesting thing to note about the complete partial order of Herbrand models of a definite program P is that while the greatest lower bound of a non-empty set of models is their intersection, and while the greatest element is the Herbrand base (a universal Herbrand model), the intuitive duals of these operations are not the least element nor the least upper bound operation. The intuitive dual of a universal Herbrand model would be, presumably, the empty Herbrand interpretation. But this need not be a model at all. For example, the definite program P could contain an atomic fact like , and then the empty Herbrand interpretation would not sastisfy that fact. Furthermore, if is a non-empty set of Herbrand models, is not the least upper bound of . That is because need not be a Herbrand model of P at all. Here is a simple example. Suppose P is the definite program consisting of clauses and . Consider the following two Herbrand models and of this program P. In the interpretation of contains all the terms built using from and . In , the interpretation of contains all the terms built using from and . If we take the intersection of and , then it is a Herbrand model, in fact the minimal one: it says that is true, as required by the first clause in P; and if two terms and are in the interpretation of , then so is . But if we take the union of and , what we get is not a Herbrand model of P at all. Because contains and , for example, but not . To get an upper bound of and , it is not enough to take their union. One must take their union and then close them under the deductive consequences of the program P. That’s the intuition, though we would need to formally define closure under deductive consequences — and it would be a bit nicer to be able to apply a model-theoretic notion (since we are working model-theoretically here) rather than a proof-theoretic one. Declaratively, we know we can get the least upper bound of a set of Herbrand models as the intersection of the set of all Herbrand models which are supersets of every model in . But this is rather a hard definition to work with. Anyhow, this is a nice example of finding an interesting abstract structure in semantics, as well as a good exercise in reasoning about such structures. Duckki Oe accepted a postdoc at MIT, working with Adam Chlipala. The project is concerned with verification of system software, so that should be quite challenging and exciting. Garrin Kimmell accepted a position at Kestrel Institute. Kestrel is a well-known research institute that applies formal methods for developing reliable software systems, largely (as I understand) for government contracts. Both of these positions will provide fantastic environments for Garrin and Duckki to continue developing their substantial formal-methods and programming-languages skills, with some of the top formal-methods researchers in the field. So, I am very, very happy about this (and so are they!). Frank Fu and Harley Eades attended several interesting research events this summer — but I don’t want to steal their thunder: you can check out their reports on NASSLLI and ICALP on their blogs (see my blogroll). We had an undergraduate researcher visiting here from Ohio State University, Angello Astorga. 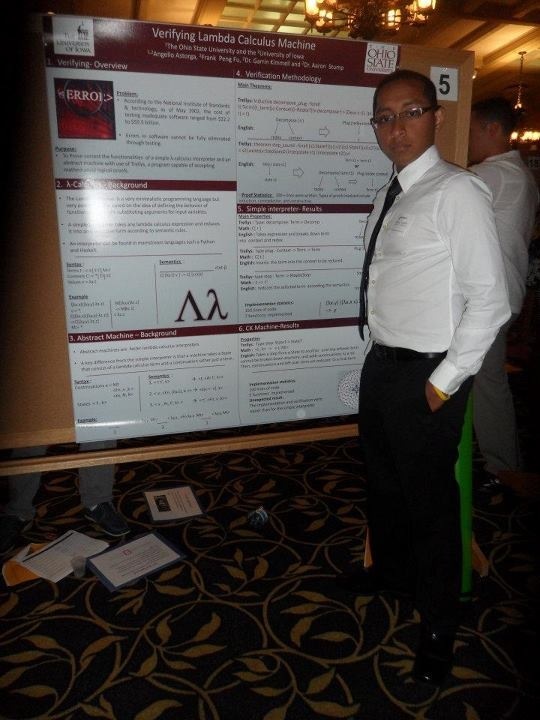 Angello was here through the Summer Research Opportunities Program (SROP), run by the CIC (Big Ten Schools + U. Chicago). This is a really great program that gives students from underrepresented populations a research experience, and a lot of mentoring and professional development activities, too. I know Angello was especially excited about the multiple practice GREs. Just kidding. It was truly a very good experience for the attendees, from what I saw. Students really did an impressive job mastering new material and presenting it at an end-of-the-summer undergrad research conference. They really knew their stuff, and did a very nice job explaining it. Angello was working here on verifying the CK machine for untyped lambda calculus using Trellys. He picked up lambda calculus and Trellys and completed (almost!) the verification in just 8 weeks, after just his sophmore year as a CS major at OSU. Wow! I was impressed. Here’s a picture of Angello with his poster. We are hoping he will present it at the upcoming Midwest Verification Days (MVD), hosted at Kansas U. September 20-21. On the research side, I am very fired up about the Dual Calculus (due to Wadler). It is a really elegant and intriguing formalism. Hopefully I’ll manage to post more about it sometime soon. The most helpful source I have found so far is “Dual Calculus with Inductive and Coinductive Types” by Kimura and Tatsuta (sorry, no free PDF seems to be available, only at SpringerLink). Hope your summer is ending well.